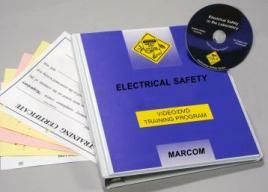 MARCOM's "Electrical Safety in the Laboratory" Video Program emphasizes the need for safety when using electricity, and discusses how to reduce the potential for accidents involving electrical shock, fire and explosions. Today, laboratories rely on a vast array of electrically powered equipment. To work safely with this equipment, employees need to understand how electricity works, be aware of common electrical hazards and know how to use electricity safely. Areas covered in the program include how electricity works, common electrical hazards, fuses, circuit breakers and grounding, using and maintaining electrical equipment, accidents and emergency procedures, and more. The video program comes with a comprehensive leader's guide, reproducible scheduling & attendance form, employee quiz, training certificate and training log. This Video Program is one of 12 in the “Elements of Safety” Laboratory Safety Training Series.